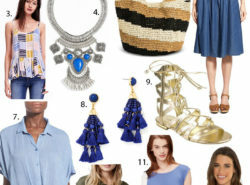 Welcome to the Amazon Fashion Haul for August! You guys know how much I love scouring Amazon for hours on end to find the best of the best pieces that they have to offer. 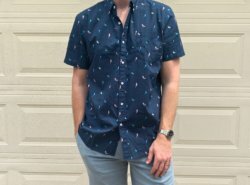 This month I tried to focus on buy now, wear now pieces that will also take you through Fall transition. Think great base layers to build upon, light jackets and transitional tops. 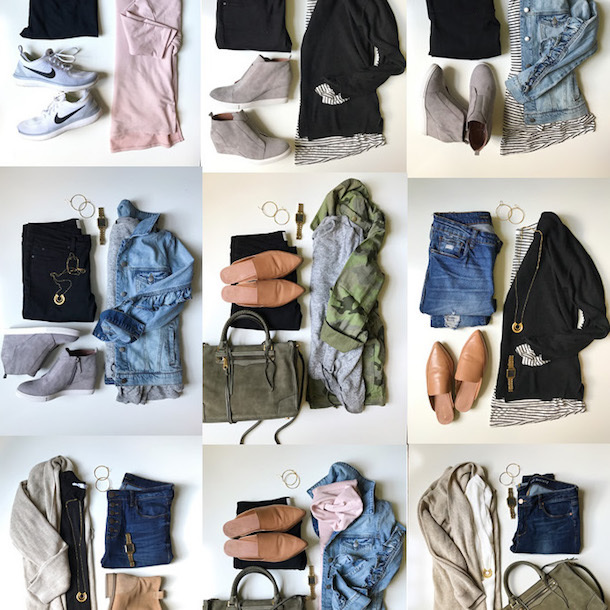 The post is written in the exact order that I’ll also be posting the try-on sessions via Instastories, so watch them there and head back over to shop. Sizing details and fit reviews are ABOVE each photo. I wore this 2 piece set in LA a few weeks back and I thought that my DMs were going to shut down with how many of you asked about it. To be honest, at first I dismissed it. I thought that the fabric felt kind of off and I didn’t even try it on for a few weeks. But when I was packing for LA I decided why not just try it on and that’s definitely where the magic happens. 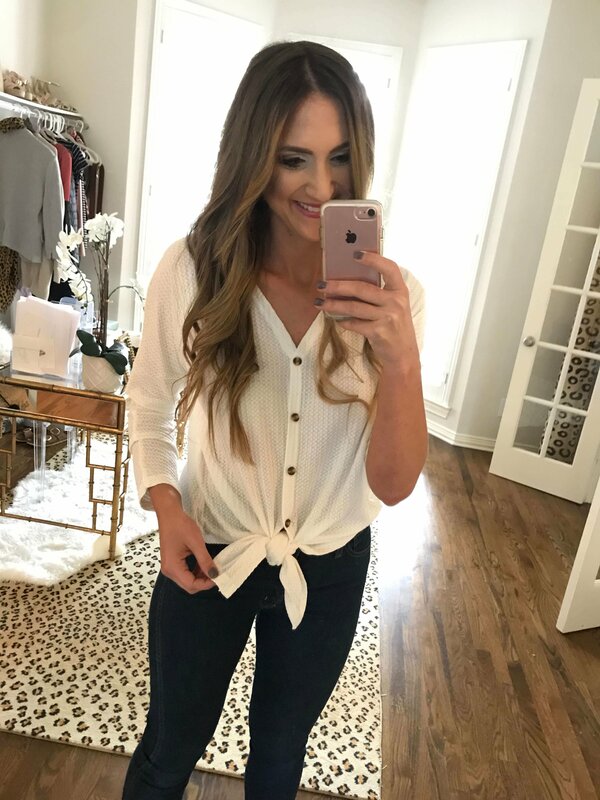 The high waisted pants paired with the crop top are the cutest duo and are still flattering and a bit flirty. I cannot tell you how many compliments I got on this outfit! It’s under $20 and I thought that the M fit great. 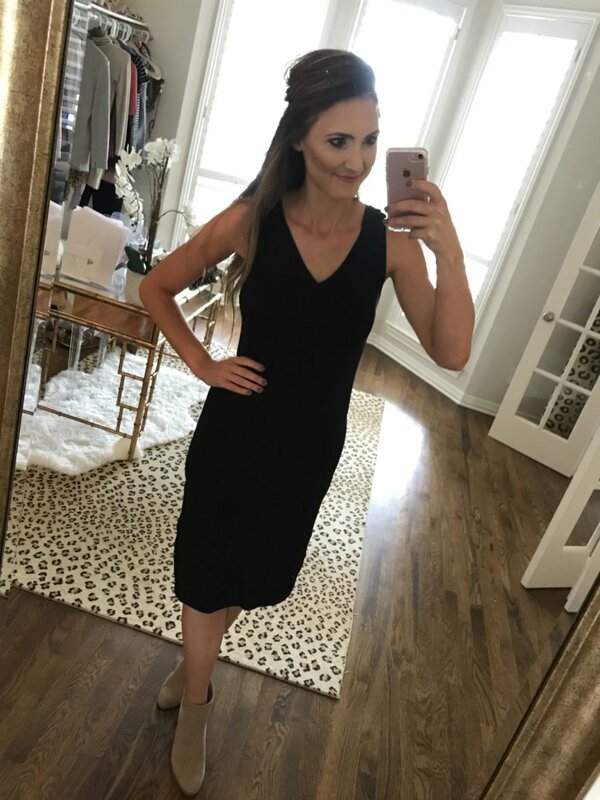 This dress is a dupe for the ever popular lace midi at Nordstrom, except that its 1/3 the price! The fit is actually pretty cute and it definitely feels more expensive than a dress that’s under $30. The M fit me great, but as a full C cup, I didn’t have ANY extra room. 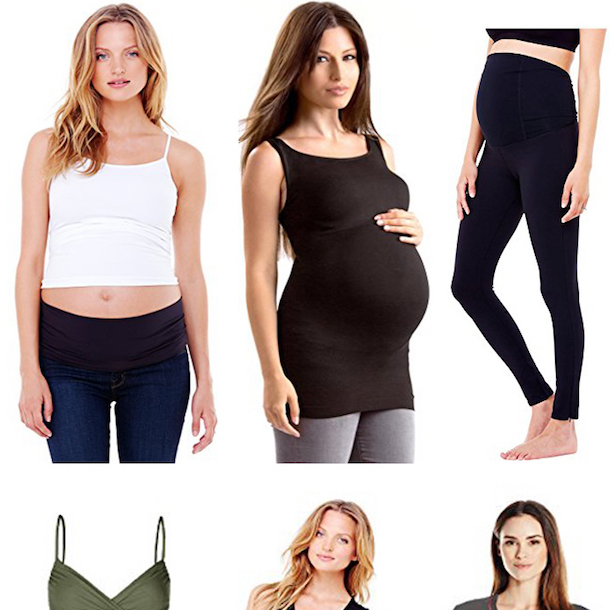 Probably not a great option if you’re larger than a C or D.
One of my favorite tops from the haul because it’s so dang practical + functional. 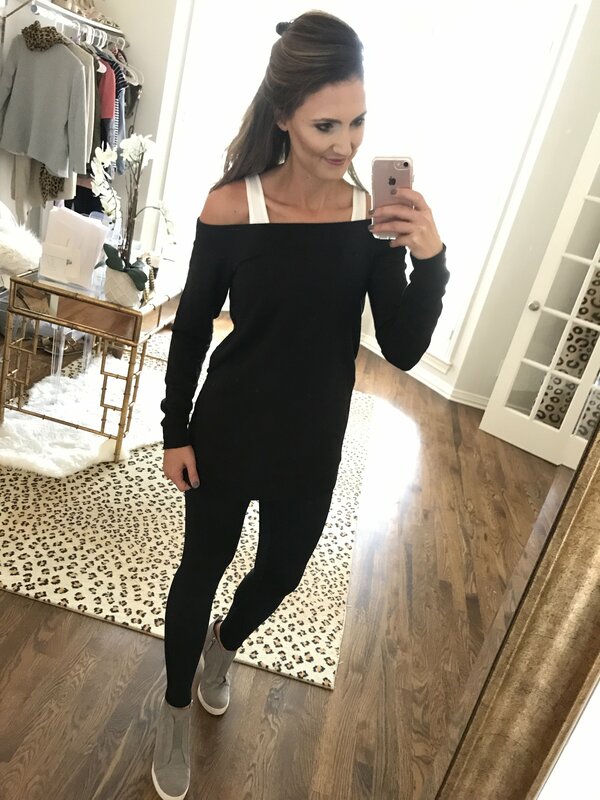 There are tons of ways to wear it (see below) and it’s one of those super soft, easy to wear tops that you’ll want to throw on every day. I’m wearing the M and I have some extra room. Another favorite! This $14 top is SOOOO good on. 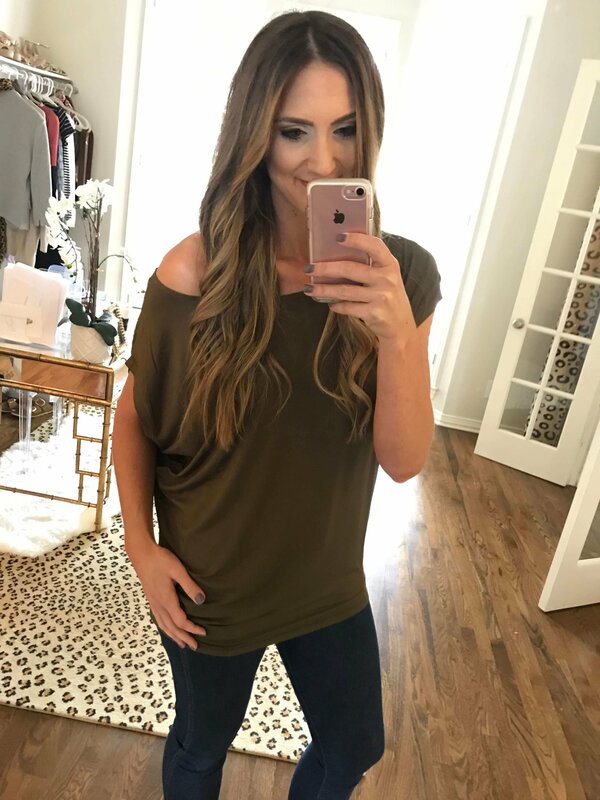 It does a great off the shoulder drape and then also has a slight banded hem to give you shape. 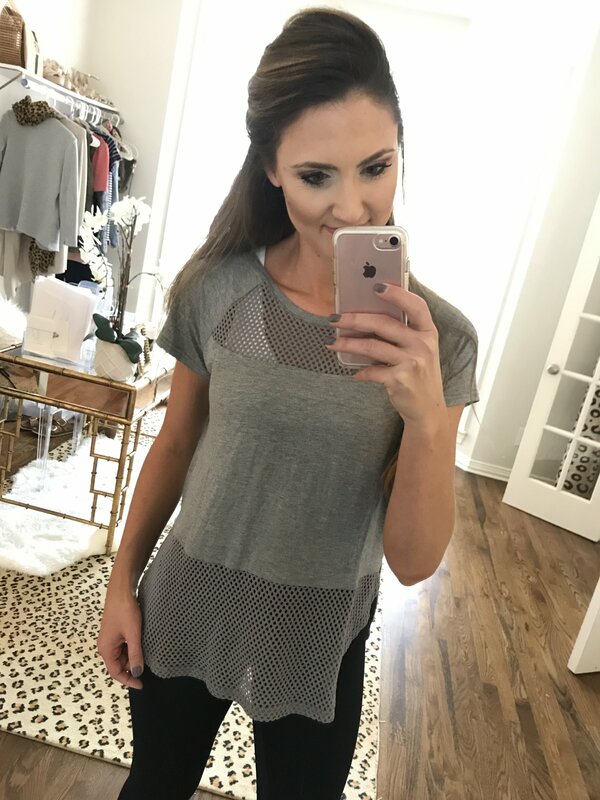 It’s a good throw on and go top for anything from errands (with a sports bra) or to a date night (with some jewelry). The small was a great fit, it does run roomy. 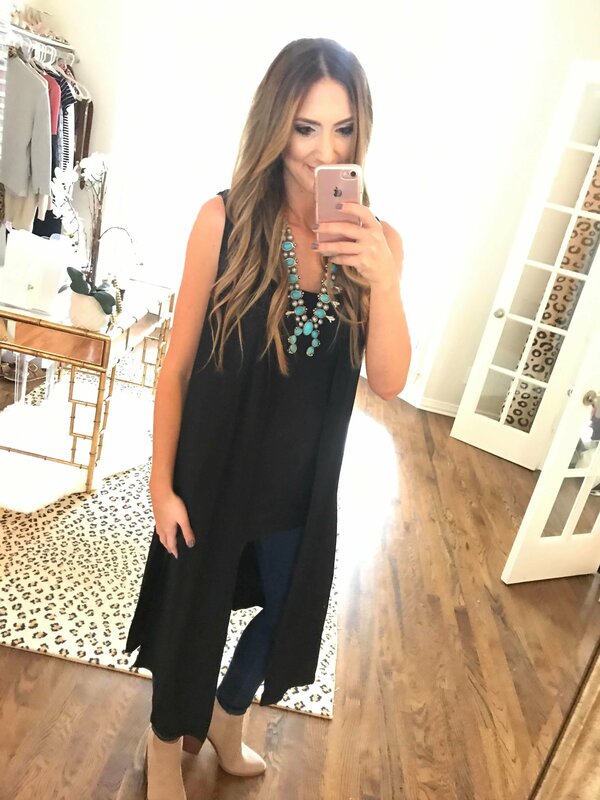 I’ve always loved a good long vest as a layering piece and this one was exactly what I was looking for for Fall. It’s a super soft cotton, has pockets and is the perfect lightweight top layer. Great over dresses, with skinny jeans or even with leggings, you’ll always reach for this thing I swear. I’m wearing the S here. Also, so many of you have asked about my squash blossom necklace recently and YEP it’s from Amazon. An awesome option that’s so affordable. 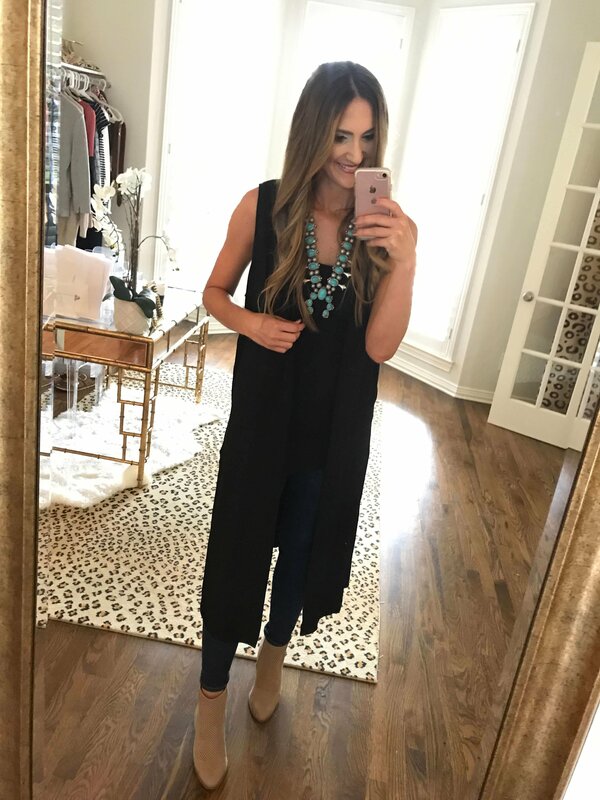 If you’re under 5’6 this vest might be too long, but THIS ONE is a great alternative with a shorter hem! This little crop jacket was just TOO good. The detailed embroidery makes it look like it’s from an upscale boutique when it’s really under $35! 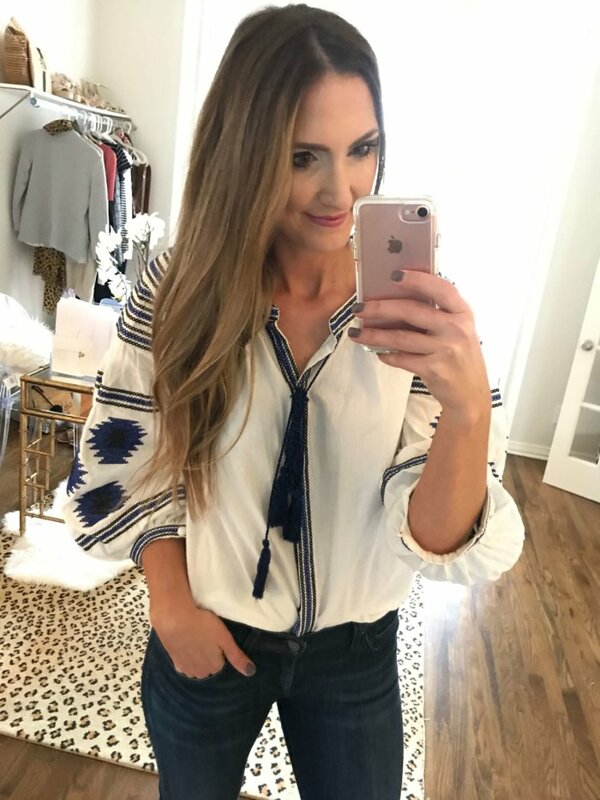 I love it paired with flares or skinny jeans and it’s also another great transitional piece that will take you through Fall. 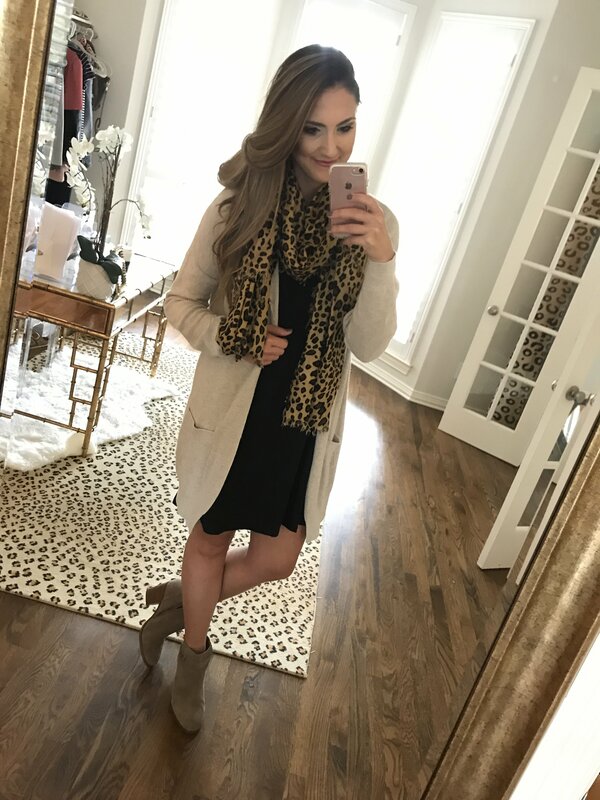 **If this jacket sells out, and you want a similar look…THIS ONE is amazing too! 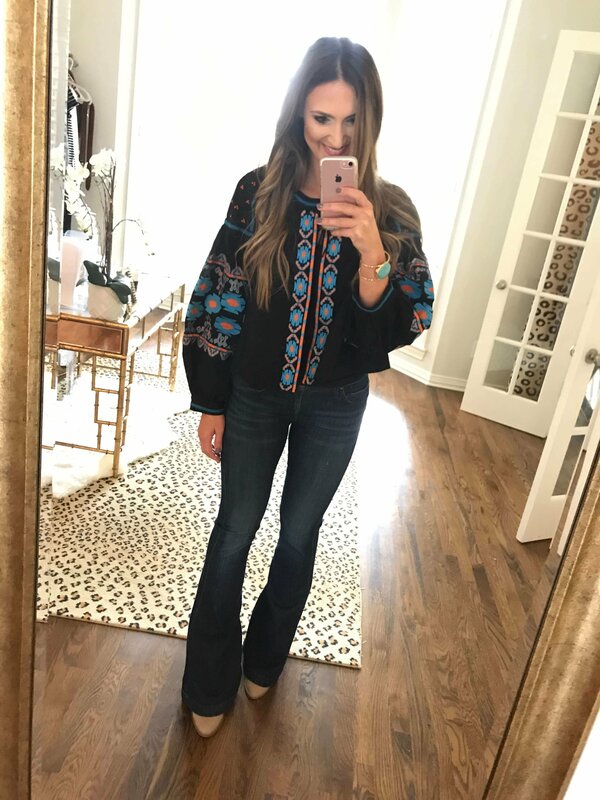 This is the embroidered top that I wore the other night with white jeans. I feel like this pic isn’t really doing it justice because it’s SO pretty. Another one with high end details for a steal. It is one size though, so if you’re an XS or a shorter Small it’ll probably be a little big. 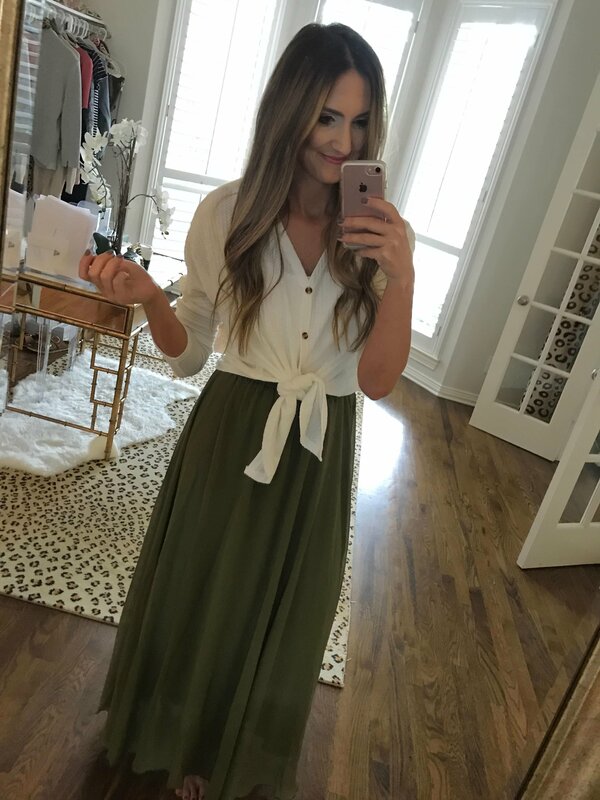 I’m loving skirts lately and I wanted to try a few of these lightweight flowy skirts to style through the Fall. This one has a nice elastic waist that stays put and the XL (length sizing) was great for me (I’m 5’9). This is a wonderful option to style in your family photos this Fall, it flows so beautifully. There are also tons of colors. Remember everyone’s FAVORITE dress from last month? 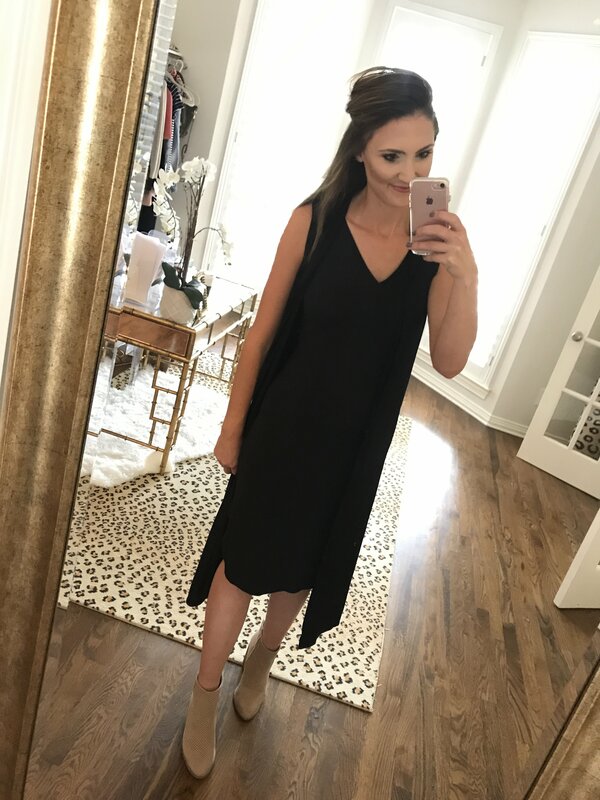 The really easy Tshirt dress that just fit right?! Well, this is her long sleeved older sister and she also fits wonderfully! This one has a slight hi/lo hem, making it just a touch longer in the back. It’s body skimming and flows away in all of the right places, but is still flattering. 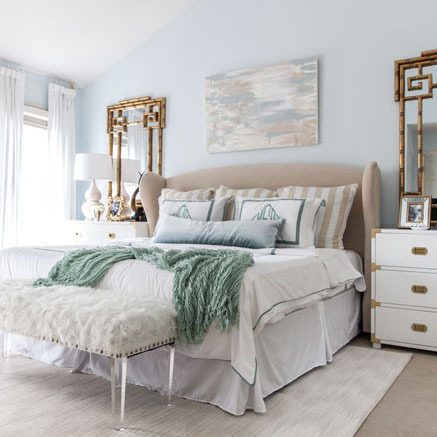 There are TONS of ways to style it as a transitional dress and this is a true winner for nearly everyone reading. I’m wearing the M here, but would have preferred a Small. Here’s another dress from the same brand. This one is a midi length and has more of a body con fit. I’m not a huge body con fan, but I do think that this is a good “base layer” dress to build upon as we transition. Throw a long vest or blazer on with it and you could totally take it from work to weekend (see below). I found another AMAZING sports bra!!!! Might be my fav yet because the back details are so much fun! Comes in quite a few colors and the M fit great (normally a 34C). 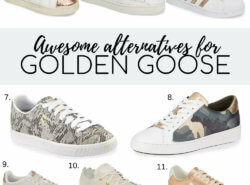 I’m all about the huge athleisure wear trend going on right now, but I am not about paying a ton of money for these pieces. 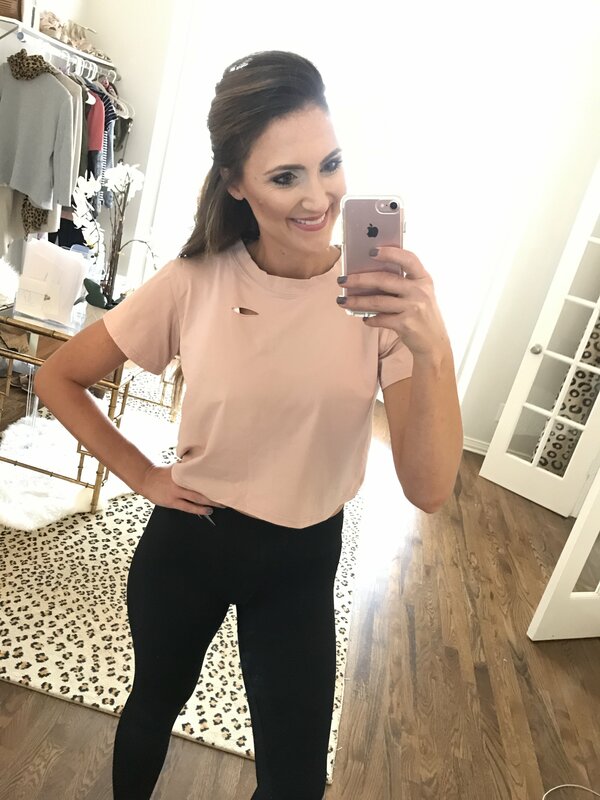 Here are a few really cute athleisure/athletic wear toppers that are great prices and so on trend. 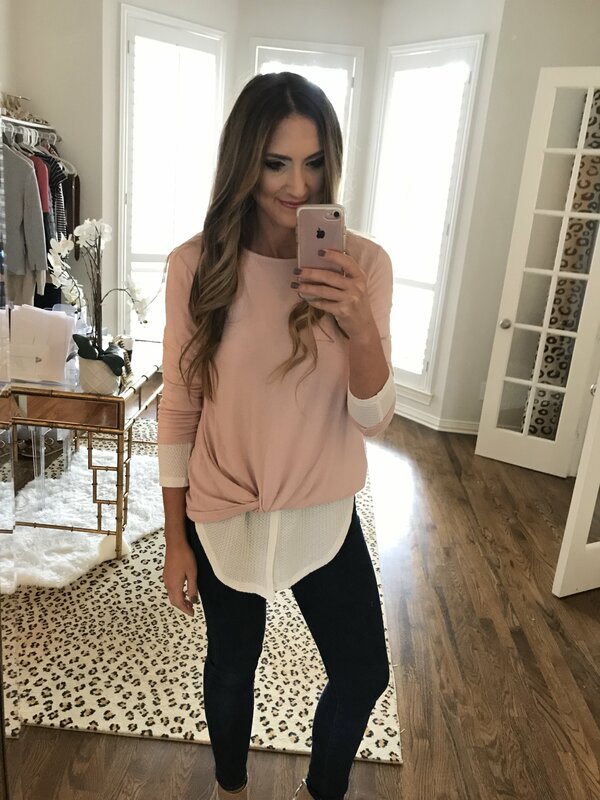 This off the shoulder sweatshirt is another piece that I could see so many of you mamas liking. 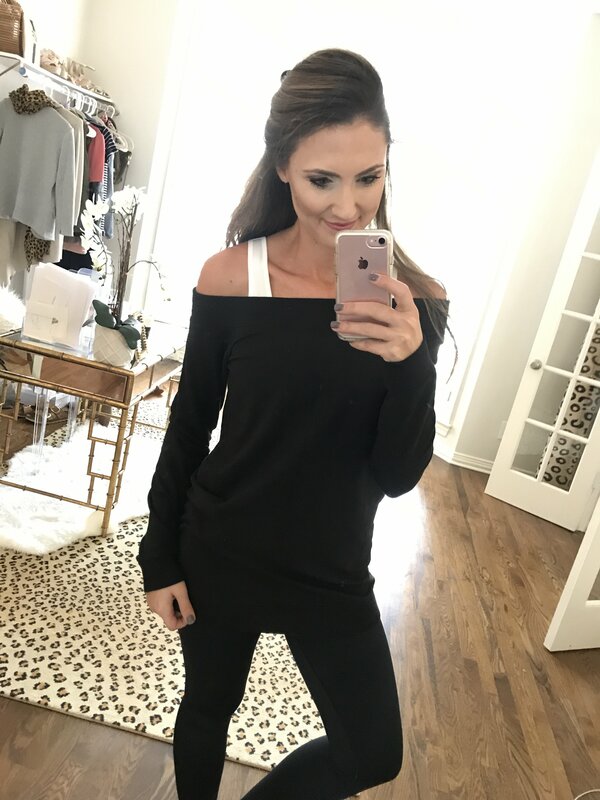 It’s a true off the shoulder (both shoulders) cut and is super soft and comfy. 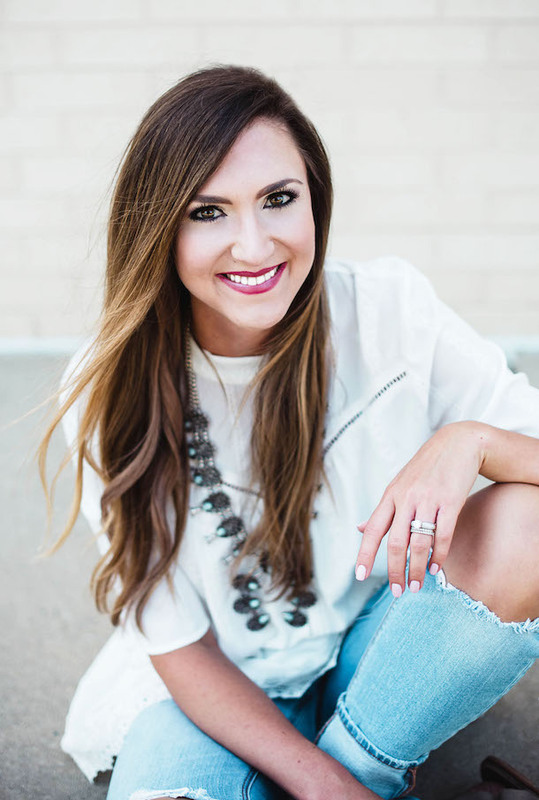 Long enough to wear with leggings but also still cute enough to wear with jeans…total winner! 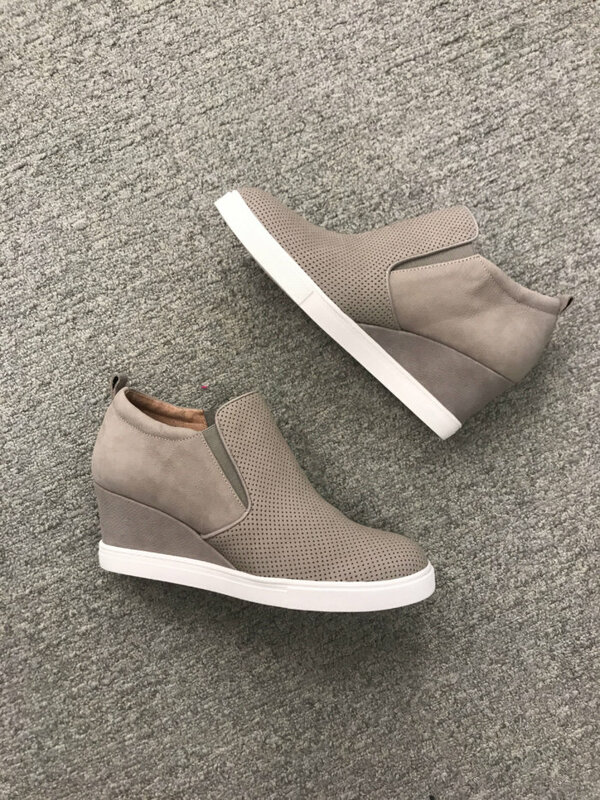 Another wedge sneaker option! 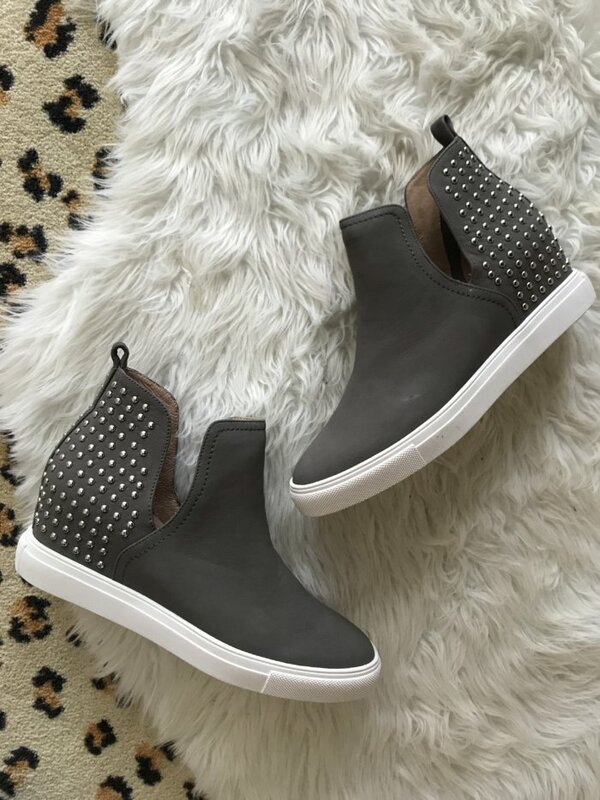 These are truly a slip on and I love the more edgy details! They ran TTS for me. I still cannot get over these darling accessories that I found! 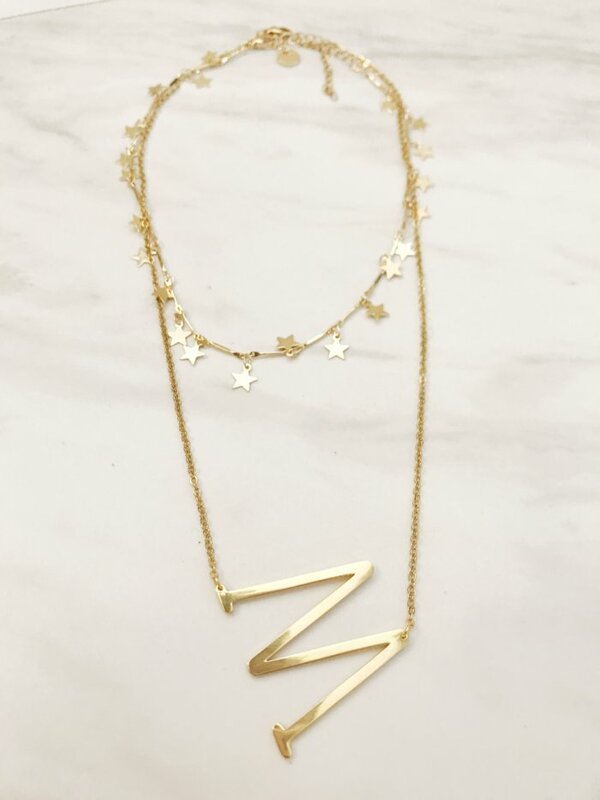 The charm necklace is a designer dupe for under $10 and the infamous sideways initial necklace is also under $10 (nearly $40 at Anthropologie)! Both are great for layering. This bag was one of my absolute favorite things because of the PRICE, functionality and quality. 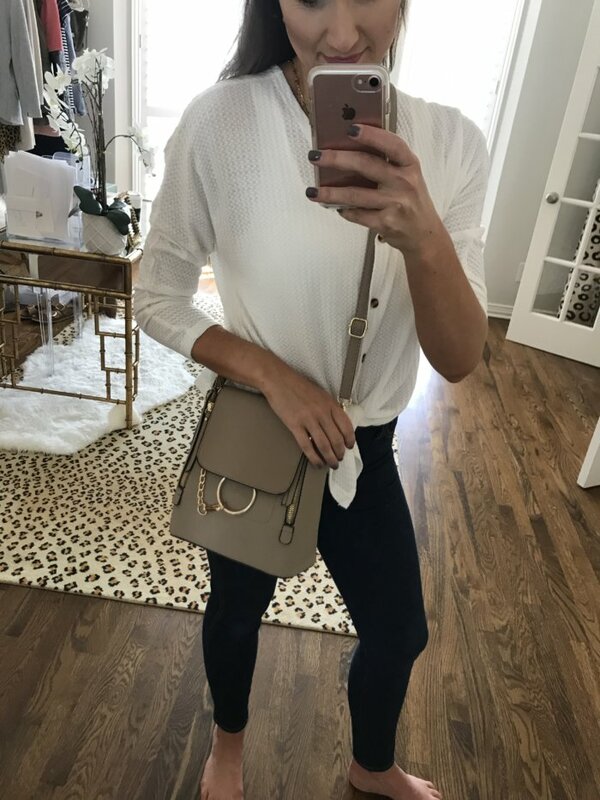 First off, it’s a really really nice bag…the quality is awesome and it’s very reminiscent of a Chloe bag except at a small fraction of the price. What I also loved is that it comes with 3 straps so that you can convert it to a cross body, a shoulder bag and a backpack depending on what you need for the day. A huge #MOMWIN! Wearing these AMAZING jammies as I type this to you and I’m obsessed. Not only are they are beautiful, girly floral but they are extra comfy and so lightweight. This is my 3rd pair of them (obviously I love them), so I sized to a M because they do shrink a little after the first dry. So many pretty patterns! Reusable lunch box containers! 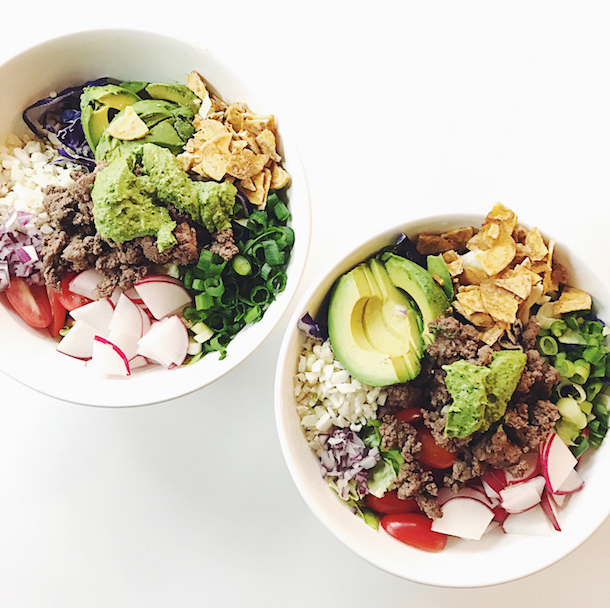 Microwave and dishwasher safe and make meal prepping lunch boxes a breeze! Slip on Sneakers for Lawson! Aren’t these so dang cute?! A dead ringer dupe for my favortie Valentino Rock Studs…except these around $50! Fall Dresses for Landry to wear to School! I bought THESE EARRINGS from Amazon for $10 and was SHOCKED to see them at Nordstrom for nearly $40! Was the Henley shirt Prime when you bought it? Delivery says Sept 20 – Oct 1 now?!? I may actually buy one of every top you featured! Thank you! I literally like everything in this post! Good thing my husband isn’t home, because he would freak out about the huge box that is going to show up at our house! Thank you! !